The information on this page is about the electronic licensing process for this title. To read information about the publication itself, please visit its main product page. The terms and conditions of licensing this title can be reviewed below. A copy of terms and conditions will also be displayed during the checkout process. In the Qty. field below, enter the number of student readers for whom you are purchasing licenses, click 'Add,' and complete the checkout process. After placing an order for electronic licenses, and after we have received payment or a signed copy of your institution's purchase order, a PDF of the licensed publication will be will be emailed to you within one (1) business day. The contents of this PDF can then be provided to students via student portal or other secure electronic content-delivery system. The delivery system must be secure. Neither the PDF file nor its contents may be duplicated, redistributed, or otherwise reproduced except to provide the PDF's educational content (not the file itself) to students through a secure electronic-delivery medium. The content can be provided to as many students as the number of purchased licenses. A full copy of the terms and conditions are below. For mass licensing (department-wide, campus-wide, institution-wide, etc. ), please email cct@criticalthinking.org. 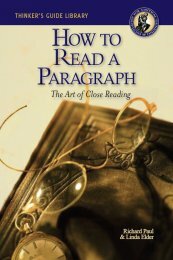 525MEL How to Read a Paragraph The Art of Close Reading [Electronic License] $6.16	 Qty. You are to be congratulated on working toward bringing critical thinking more deeply into the teaching and learning process. To this end, we are very pleased that you are purchasing electronic licenses for our work. Entering into an electronic licensing agreement establishes a partnership between you and the Foundation for Critical Thinking (FCT). A primary purpose of this agreement is to protect the copyrighted materials of the Foundation for Critical Thinking and its authors, while advancing fairminded critical thinking across the world. Possessing intellectual products such as written materials in electronic form entails certain ethical obligations. As a 501(c)(3) non-profit organization, the Foundation for Critical Thinking cannot afford to freely offer all of its intellectual resources and products. Some must be purchased if we are to continue fostering critical thinking through the FCT. The information below delineates your obligations as purchaser and maintainer of our electronic source material. 1. The electronic file(s) to which the purchaser will gain access is/are specifically to provide student access to the file's/files' educational content through the relevant institution's student portal(s), or other secure electronic content medium/media, for educational purposes. 1a. To this end, the Foundation for Critical Thinking will supply the relevant electronic file(s) only to the institutional employee(s) responsible for adding content to the institution's student portal(s), or other secure electronic content medium/media. Once your electronic purchase is complete, you will be contacted by the Foundation for Critical Thinking to verify your institution’s authenticity. Once this is complete, a PDF file will be send to your institution electronically for uploading to a secure student/faculty portal. 1b. The educational content of the electronic file(s) is not to be provided to students in downloadable format, or any format which would allow students to copy, share, or otherwise reproduce said content. 2. The electronic file(s) is/are not to be shared, copied, or otherwise reproduced except to establish the file on a medium, or on media, necessary to facilitate the usage outlined in item 1 above. 3. The educational content of the electronic file(s) is not to be shared, copied, or otherwise reproduced except in ways necessary to facilitate the usage outlined in item 1 above. 4. The content of the electronic file(s) is not to be provided to a greater number of students than the number of electronic licenses purchased. In order to provide the content to additional students, a new purchase must be made. 5. If you are faculty purchasing electronic licenses for your students, this agreement gives you permission to allow access for one semester to the number of students specified. If you are administration purchasing electronic licenses for institution-wide use, then this agreement authorizes you to provide access to the relevant guides for one year from the date of purchase. 6. Dispute Resolution: In the event of any dispute as to unlicensed access to the above electronic file(s) or the number of students who have had access, the Foundation for Critical Thinking shall bring such issue to the contracting party’s attention in writing within sixty (60) days of first becoming aware of the issue. The contracting party shall have the obligation of verifying to the Foundation’s satisfaction the exact number of students who have had licensed and unlicensed access. That latter number shall be multiplied by the cost of a single license for access to calculate damages, to which shall be added 10% legal interest from the date the contract is signed. If the contracting party is unable to verify the exact number who had unlicensed access, then the Parties agree to a Liquidated Damages provision of double the number of licenses purchased multiplied by the cost of a single license for access. If the Parties are unable to come to agreement within thirty (30) days after submission of the issue in writing by the Foundation, the issue shall be submitted by either party to binding arbitration within the next thirty (30) days in Marin County, California, under the Commercial Arbitration Rules of the American Arbitration Association. The prevailing party in such arbitration shall recover from the other party its costs of arbitration, including any attorney fees. Thank you for the very important role you are playing in advancing fairminded critical societies.